351W/5.8L oil pan kit. 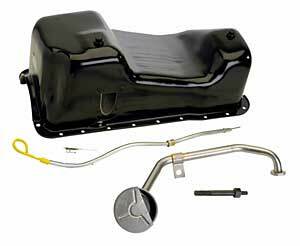 Includes rear sump oil pan, dipstick, dipstick tube, pickup, and main cap stud. Ideal for engine swaps. Fits 1979-1995 Mustangs and Fox chassis vehicles. Fits 1969-1997 production blocks and 397-M-6010-A351/A58 blocks. Same pan as used on 351 crate engines. Fasteners not included. Ford Racing offers these high quality oil pans for your project vehicle at a reasonable price. With the increased popularity of putting Ford engines into project vehicles, Ford Racing offers these oil pans with off the shelf fit and finish quality. If you are swapping an engine increasing the oil capacity needs or going racing you can count on Ford Racing oil pans to help you get the job done confidently. Don't waste valuable time and money chasing down custom one off oil pans and pickups. Get all the parts you need for your project at a reliable source at a reasonable price. Does Ford Performance M-6675-A58 fit your vehicle? M-6675-A58 is rated 5.0 out of 5 by 2. Rated 5 out of 5 by Redsbodyshop from 351 swap oil pan Perfect fit for fox mustang swap to 351. No baffle inside but still a good product. What is the tube thread that goes into the oil pan? And can you buy just the dip stick and tube ? If so what is the part number. This appears to be 1/2&quot; straight thread.